It would be fair to say that every year when the eventing season ends most of us, particularly those that have had a busy season. Will, initially at least, be grateful of the opportunity to take a break from the busy hustle and bustle of eventing life. Maybe your horse enjoys some downtime in the field? Or maybe your significant other enforces that you have some social activity outside of the eventing circle? Whatever your off-season might include, it is never long before you are dreaming of days spent galloping Cross-Country. And that’s where Arena Eventing comes in. A sport that has boomed in popularity over recent years. It seems at least to be going some way to filling the void that is eventing’s off-season. First things first, what on earth is arena eventing? I guess you could say that it ‘does what it says on the tin’ to some extent. But of course there is a little more to it than that. Arena Eventing usually will consist of a round of Show Jumping. This is followed immediately by a round of Cross-Country fences, all from the safety of an arena. In some cases, the Cross-Country section may be made up of simulated fences. Or it may in fact be portable Cross-Country fences (the real deal!). Some venues are even able to incorporate water, ditches and steps! There will almost always be an optimum time, as with Eventing, this isn’t about how fast you can go. As with everything, this is open to interpretation and it is always best to check with a venue before entering to understand exactly how their day will run. I feel that the easier question to answer here would be ‘where isn’t it?’! 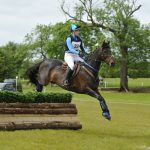 British Eventing run many Arena Eventing fixtures throughout the winter months, at equivalent heights to BE80, BE90 and BE100, these are all run on a surface with the possibility of qualifying Championships at the end of the ‘Winter Eventing Season’! Then you have the many unaffiliated venues throughout the UK running their own versions of the discipline. Everything from local equestrian centers to show grounds and even the British Eventing competitions mentioned above often have classes available to non-members. Riding clubs also run their own Arena Eventing competitions. These competitions start at 70cm and finish up at 100cm. So, in summary whether you compete affiliated, un-affiliated or as part of a riding club there really is something for everyone. Giving you opportunity to school over a variety of different types of fences during the winter months is a huge benefit. Many cross-country schooling venues may be shut for the winter. With the start of the Eventing season seemingly getting earlier and earlier. It is not always that easy to fit in a cross-country schooling session before the start of the season. Arena Eventing gives you and your horse opportunity to see something other than colored poles. It is great for fitness, for both you and your horse. There’s no mud involved (except for the bogs you tip toe round in the lorry park). If you’re lucky enough, sometimes you might even be inside out of the rain. Another benefit is that riders have a start time, and during the cold and usually wet winter months this can save you a lot of waiting around. I am not sure you can ever match the feeling of tackling the countryside just you and your horse, but Arena Eventing at least is going some way to trying. Cassey is a self confessed average amateur event rider, juggling two horses, two dogs, a full time job and planning a wedding! The past year has been spent successfully rehabbing King after a Kissing Spin operation. Hopefully make his return to eventing in 2018. Twiglet galloped into the team at the end of 2017. She is gearing up for her first public appearance in 2018. The goal is to qualify one or both horses for Badminton Grassroots in the future.